In 1975, I attended an Ansel Adams Photography Workshop in Yosemite National Park. His workshops were fairly large: 40 students and five instructors. They divided us into groups of eight, and the groups rotated through the instructors. One of the instructors was Dor Bothwell, a painter I believe. She gave us some black and white construction paper, and some scissors. She told us to cut out some black shapes and lay them on the paper. Well, I had not played with scissors, paper, and glue since elementary school, and I was pretty skeptical of the whole exercise. I did not give much thought to my collage. She wandered around, and when she got to me she said something like, “That’s OK, but go look at what Sarah and Roger did.” I do not remember what theirs looked like, but I do remember the sense of motion they had created with some black blobs lying still on a white background. Ever since then, a sense of motion has been an aspect of most of my photographs. This photograph is an example. 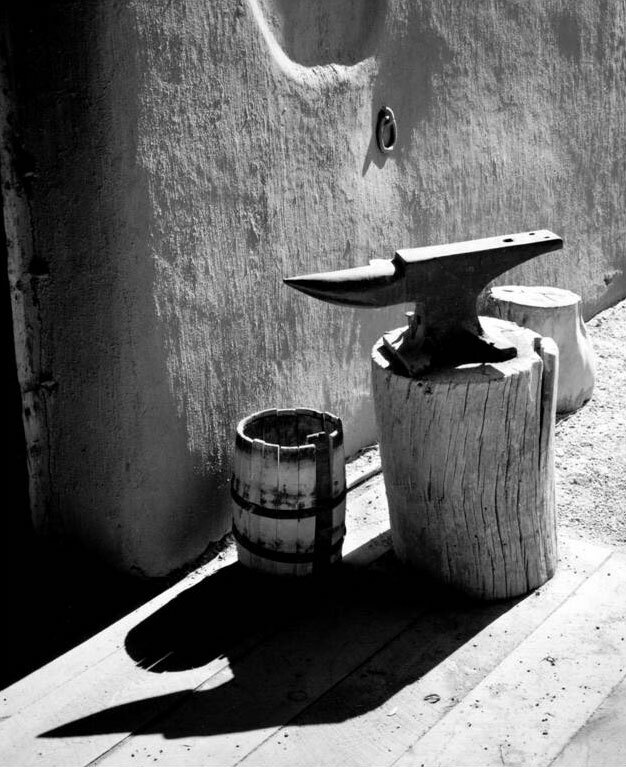 It was taken at Bent’s Fort Colorado, which as an old trading post on the Santa Fe Trail. I believe the lines and shading in this photograph give a feeling of light flooding in from the right and pouring out the lower left of the photograph. Other lines suggest water trickling down from the top of the photograph, onto the anvil, into the bucket, and leaking out the lower left. I also like the contrasts in this scene. There is the contrast between the bright and shaded areas, between the heat suggested by the bright sun and the adobe architecture and the coolness suggested by the water bucket, between the rough adobe and the smooth iron, between the flood of light from right to left and the slow trickle from top to bottom. I think the very wide tonal contrast in the photograph accentuates and amplifies the other contrasts.